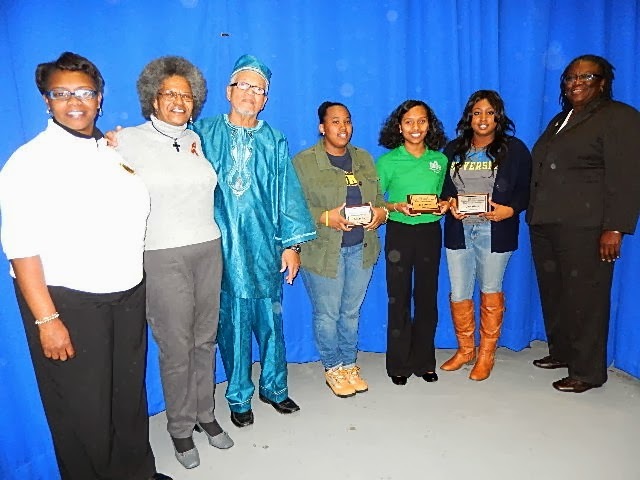 Baton Rouge, LA – The SU Ag Center and the Division of Agricultural, Family and Consumer Sciences hosted the 20th Annual Black History Quiz Bowl on Thursday, February 27, 2014 SU Ag Center. The results are in. 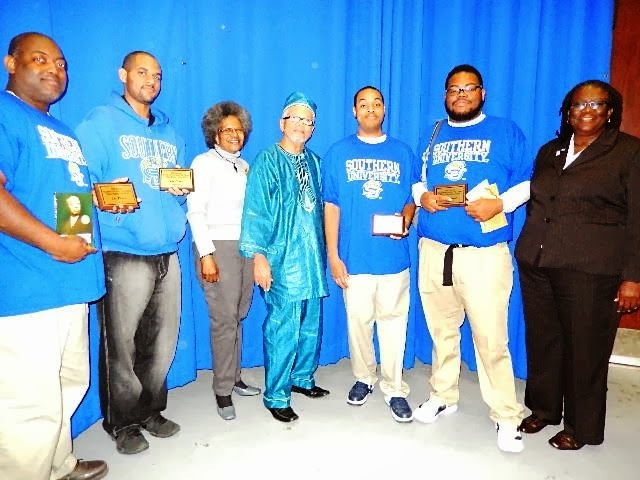 The “Southern Intellectuals” team took first place followed by “MANRRS Crusaders,” and the “MANRRS Trail Blazers” came in third. Chancellor Leodrey Williams in his welcome statement, emphasized that "all contestants are winners" just for making arrangements to participate. Dr. Owusu Bandele, professor emeritus, has organized the event for the past 20 years, and can be reached at 225-284-0063 or obandele@cox.net. Baton Rouge, LA - The Southern University Agricultural Research and Extension Center is excited to receive an influx of youth, families and animal at the Maurice Edmond Livestock Arena for the 71st Annual Livestock Show. The show contestants are arriving and weighing-in their livestock. Showing and judging of animals start tonight at 6:30 for beef breeding and dairy showmanship. Other categories of cattle and species – goats, hogs, and sheep start showing at 8:00 am on Friday; and guided tours for school aged children start at 9:00 am. The show culminates on Saturday, March 1st with a live auction. During the three-day event, young 4-H and FFA members from across the state will have the opportunity to display animals that have been showcased or have won in parish competitions. Each year, hundreds of youth ages 7-19 vie for top prize in this contest. The prizes range from ribbons to top dollar from the sale of champion animals. The pre-conference session, focused on grant-writing, will be held on March 13 from 8:30 am-Noon, and the conference begins that Thursday evening with the opening reception. 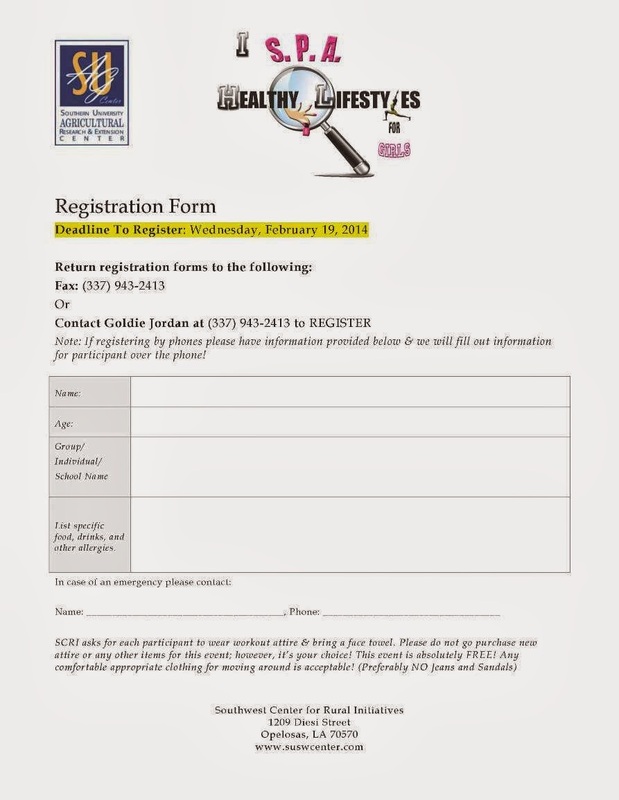 Registration is required, and is complimentary by March 3, 2014. Form is available at https://db.tt/twxhlODJ. Onsite registration will cost $25.00. Baton Rouge, LA – Research scientists at the Southern University Ag Center continue to study the impact of everyday happenings on the human environment, health and future generations. The findings from these studies help mitigate issues in a timely and cost effective manner. Recently, Dr. Yadong Qi, Professor of Urban Forestry has published an article in an international magazine that reveals the role of trees in protecting humans from ultraviolet radiation for healthier living, particularly in urban areas. Ozone depletion in the upper atmosphere has resulted in a significant increase in solar UVA and UVB radiation on the Earth’s surface. When Ultraviolet B radiation reaches the Earth’s surface it causes problems to public health and the environment. The need to reduce these impacts is crucial, but without understanding nature’s ability to regulate and potentially curb these damaging properties, scientists are unable to devise preventative mechanisms. For example, the link between excessive exposure to UVB radiation and skin cancer has long been established. UVB tolerance in trees could play a role in skin cancer prevention. The study tackles the issue by monitoring UVA and UVB reduction by tree canopy of live oak. “The goal is to discover UVB protection strategies, leading to a better understanding of the UVB tolerance mechanisms of various broadleaf trees in the Southern US,” Dr. Qi said. Since leaves absorb more than 90% of UVB radiation, the study set out to discover where and how such a high amount of UVB is absorbed. The study looked at the leaf optical properties of broadleaf species and discovered that, tree leaves can generally absorb 91-95% of incident UVB radiation, regardless of tree species or leaf age. The study utilized a fiber optic microprobe system combined with anatomical knowledge of the leaf to measure the depth of UVB light penetration. All leaf samples were collected from a local arboretum and urban tree farm on the SU campus in Baton Rouge. The project was funded by US Department of Agriculture – National Institute of Food and Agriculture. BATON ROUGE, LA - The 10th Annual Procurement “CONNECTING BUSINESSES TO CONTRACTS CONFERENCE” will be held at Southern University Smith Brown Memorial Union, April 16, 2014 on the Baton Rouge campus. The goal of the conference is to stimulate the economy by aligning existing and potential business owners, small contractors, non-profit organizations, and others with contracting officers, and purchasing agents, as well as providing an outlet to network and exchange information and ideas. 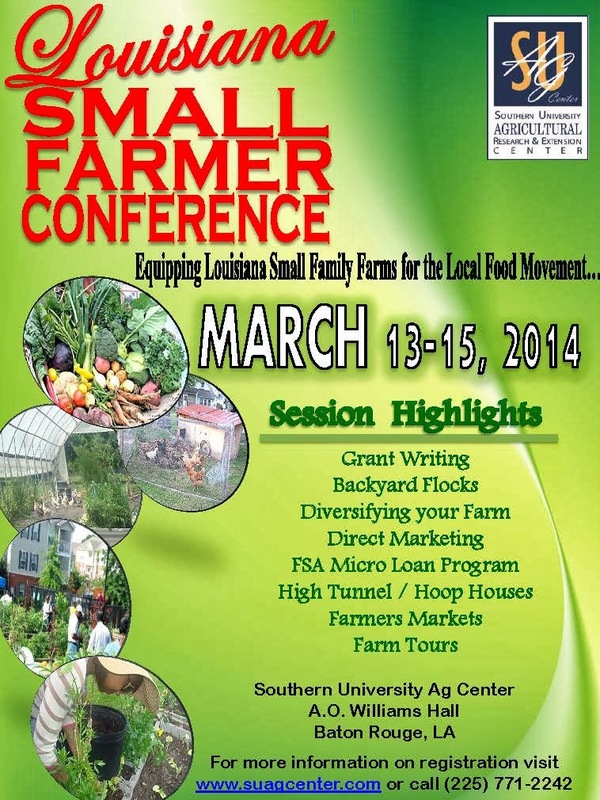 Baton Rouge, LA - The Southern University Agricultural Research and Extension Center will hold its Annual Louisiana Small Farmer Conference on MARCH 13-15, 2014 at the SU Ag Center. For small farmers who are interested in building up existing farms, transitioning or moving towards diversifying family farms and need assistance, this is the conference for you. Topics to be covered include: Grant Writing, Backyard Flocks, Diversifying your Farm, Direct Marketing, FSA Micro Loan Program, High Tunnel / Hoop Houses, and Farmers Markets. Farm Tours will also be part of this conference. For more information, please contact us by email at zanetta_augustine@suagcenter.com, or phone (225) 771-2591. We look forward to seeing you and your family at this year’s conference. 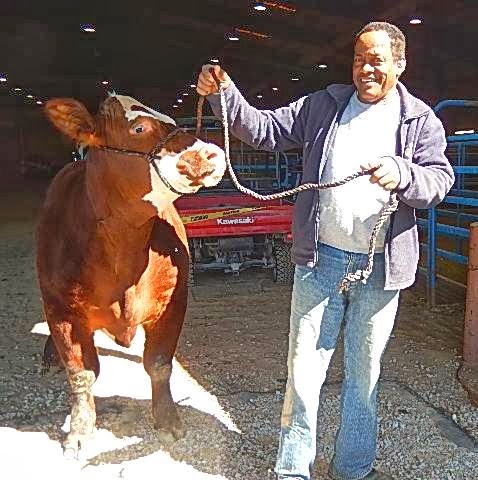 Baton Rouge, LA - The Southern University Agricultural Research and Extension Center will hold its 71st Annual Livestock Show for youth participants, February 27-March 1, 2014 at the Maurice Edmond Livestock Arena, 14600 Scenic Hwy, Baton Rouge, LA 70807. During the three-day event, young 4-H and FFA members from across the state will have the opportunity to display animals that have been showcased or have won in parish competitions. Each year, hundreds of youth ages 7-19 vie for top prize in this contest. The prizes range from ribbons to top dollar from the sale of champion animals. The main contests will include hog, sheep, cattle, and goat showmanship as well as guided tours for area schools. The awards presentation and live auction will take place at the arena on Saturday, February March 1, 8:30-11:30 am. 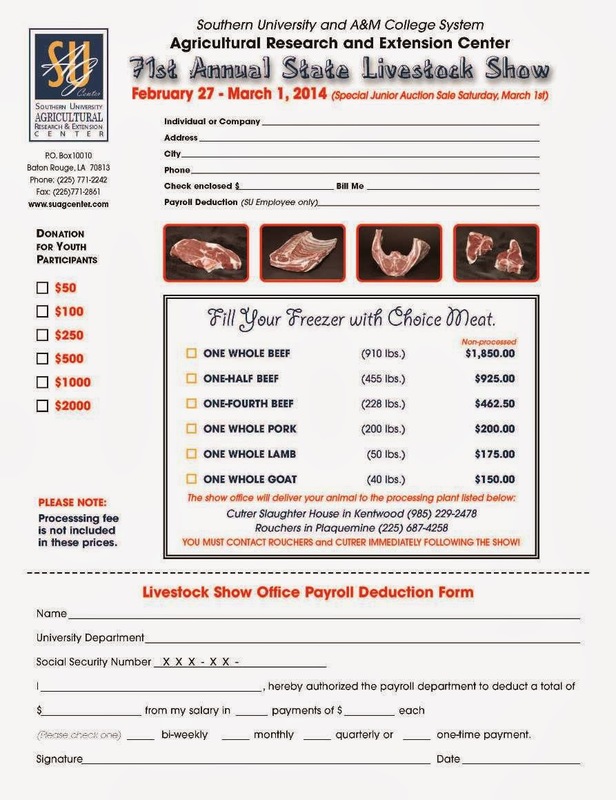 Proceeds from the meat sale go towards scholarships for participating students. 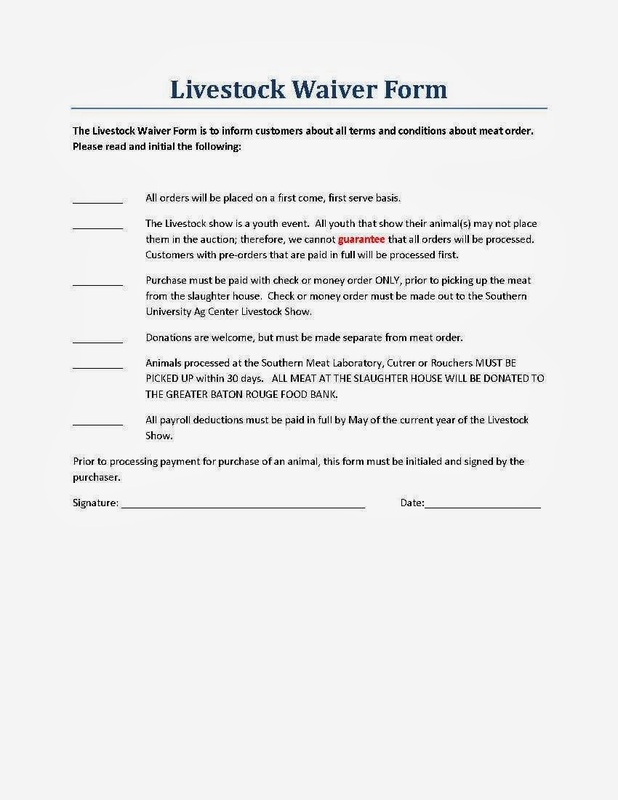 The purposes of the show are to stimulate a greater interest in increasing the production of livestock among farmers in Louisiana; serve as a basis for improving breeding practices for livestock; create interest in producing livestock products as business enterprises; assist in developing a better spirit of cooperative effort among rural and urban residents; and provide an opportunity for youth to develop ownership and leadership skills. 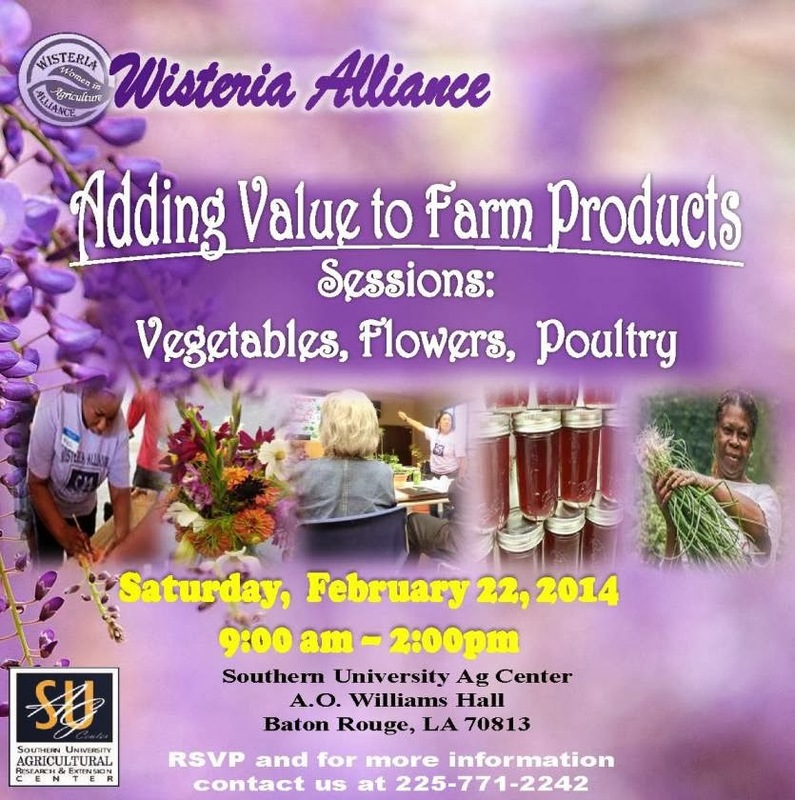 Baton Rouge, LA –The Southern University Ag Center will hold its first 2014 workshop in the Wisteria Alliance training series on Saturday, February 22 at the SU Ag Center (A.O. Williams Hall) from 9:00am -2:00pm. This session will teach participants varied techniques of adding value to farm products. The training is open to the public at NO COST. Participants are required to make reservation by calling 225-771-2242 as soon as possible. For further detail, please call 225-771-2242. 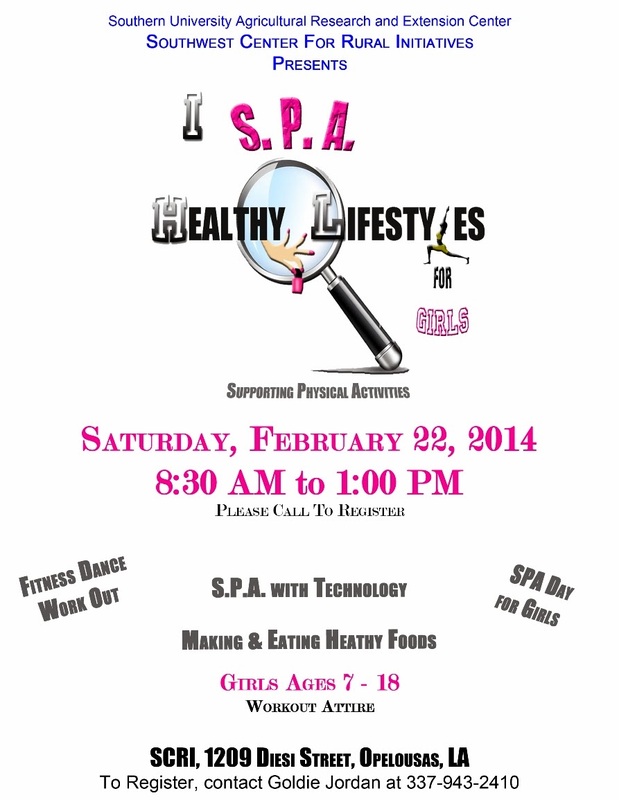 OPELOUSAS, LA – The Southwest Center for Rural Initiatives will present Supporting Physical Activities (SPA) Healthy Living Program for Girls on Saturday, February 22, 2014, from 8:30 a.m. – 1 p.m. at 1209 Diesi Street, Opelousas, La 70570. Do you want to make Living Healthy fun for girls? 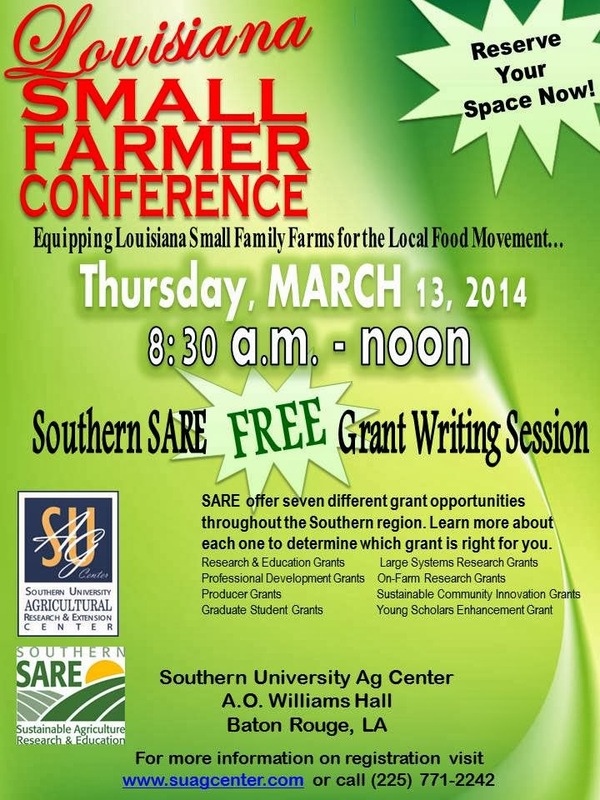 The Southwest Center for Rural Initiatives presents “S.P.A. Healthy Lifestyles for Girls” is doing just that. S.P.A. for girls is a fun program to make youth find new alternatives towards achieving healthy lifestyles in a ladylike way. This FREE program is open to any girls ages 7 – 18. Please note that registration is required for event participation to help with proper preparation. DEADLINE TO REGISTER: Wednesday, February 19, 2014. All participants must bring workout attire, and be ready to have a SPA Day experience! Parents are welcome to stay and have fun too. 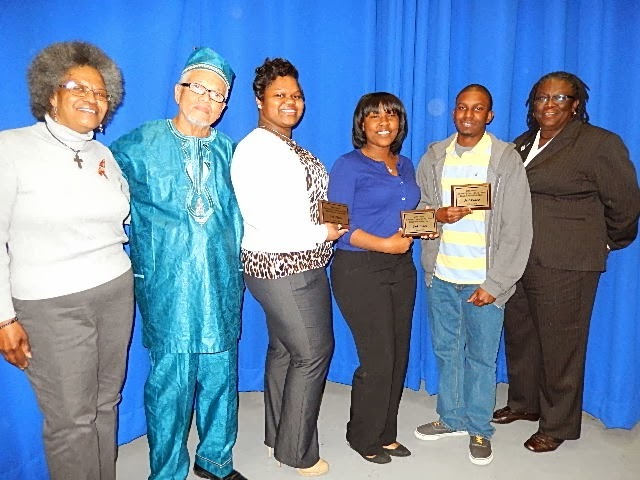 Baton Rouge, LA – The SU Ag Center and the Division of Agricultural, Family and Consumer Sciences will host the 20th Annual Black History Quiz Bowl on Thursday, February 27, 2014 at 3:00 p.m. in the SU Ag Center Auditorium. Previous Black History Quiz Bowls were quite successful, and were enjoyable and exciting educational events that really stimulated our students. Once again, we are encouraging all divisions, clubs and other organizations and individual students within the college to form student teams. Although we strongly encourage students from our college to participate, teams can include members from other colleges. Faculty encouragement of students has always been a very crucial part of getting enough teams registered for this event. Your cooperation and encouragement are very critical this time around. Each team will consist of four players, one of whom should serve as captain. Divisions and organizations can form more than one team if they so choose, and are encouraged to do so. Teams must sign the roster in the Dean's complex by Wednesday, February19, 2014 in order to participate. A variety of topics will be covered, including current events, politics, history, sports and entertainment. Study guide and rules are attached. Study guide and students registration are also available via email at obandele@cox.net. Registration forms are also available in the Division of Agriculture, Family and Consumer Science Office in Fisher Hall, Rm 102. We will also need volunteers to serve as judges, time keepers, and official scorers. 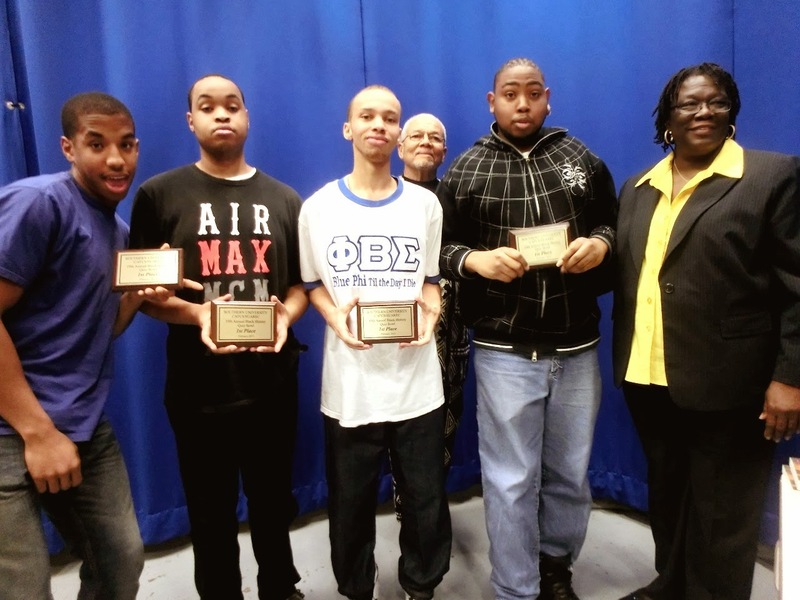 Volunteers who can assist in this year's Black History Quiz Bowl should contact Dr. Owusu Bandele at 225-284-0063 or obandele@cox.net. 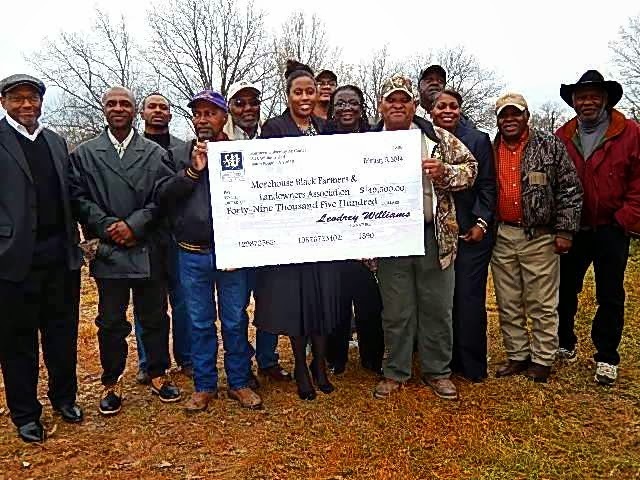 Baton Rouge, La – The Southern University Agricultural Research and Extension Center has signed an agreement with the Morehouse Parish Black Farmers and Landowners Association. 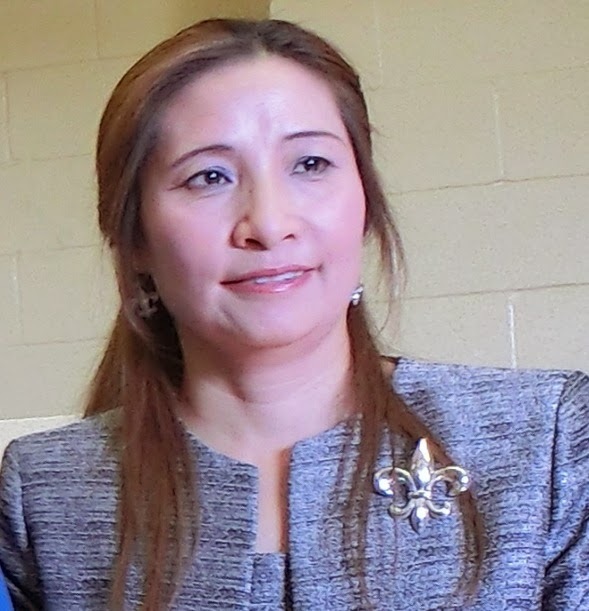 The two entities have agreed to launch a pilot project that will explore the possibility of small farmers in Morehouse Parish growing vegetables for commercial retail markets in local grocery stores as well as local school districts. The SU Ag Center has formally entered into this agreement with Morehouse Parish Black Farmers and Landowners Association at a public signing today, February 5; Mr. Antoine Downs and Dr. Gina E. Eubanks, vice chancellor for Extension as the signers. Rep. Katrina Jackson, District 16, attended the signing. Ms. Jackson expressed her excitement about the project. "The awesome thing about this is the commitment of the SU Ag Center to our farmers, youth and community." Also present at the signing from SU Ag Center were Adell Brown, Exec. vice chancellor and vice chancellor for Research, and others to encourage project participants. The primary expected outcome of this pilot project is a realistic, factual and accurate assessment of how small farmers in Morehouse Parish can identify the opportunities in making the transition from agronomic crops to growing vegetables. This project will benefit small farmers in the Parish as the success of this project will create several opportunities for small, limited resource, and/or minority farmers to either diversify their operations or transition from small-scale agronomic crops to alternative enterprises such as vegetables. For further detail, contact Dr. Dawn Mellion-Patin at 225-771-3532 or dawn_mellion@suagcenter.com.